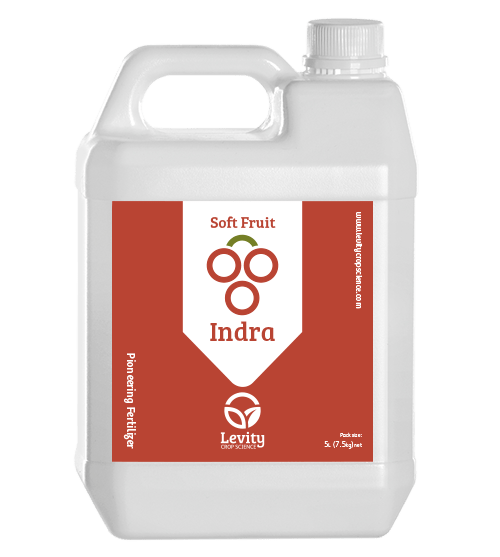 Indra for Soft Fruit is a product that improves growth and quality of soft fruit by helping the crop cope with stress caused by heat, cold, salinity, drought, and high UV light. Stress causes crops to produce toxins (ROS) that damage cells, and reduce quality. Indra promotes the plants own antioxidant production, and supplies the nutrients needed to make their manufacture possible. Indra can help protect crops from loss of quality and yield, and also prevent loss of colour due to UV.